New York City’s Filipino population was the fourth largest Asian ethnic group in New York City, behind Chinese, Indians and Koreans. 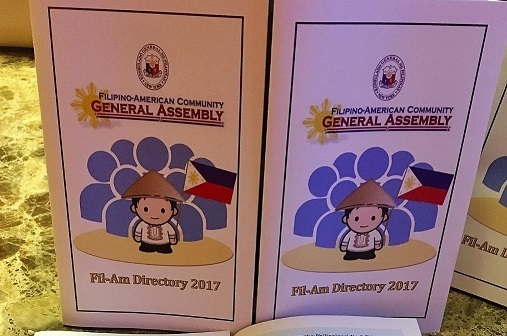 From 2010 to 2015, the Filipino alone or in combination population in New York City increased by 5 percent from 81,200 to 85,065 – a faster growth than the city’s overall 4 percent increase but less than the 13 percent growth of the total Asian population. The Filipino population alone population increased by 0.3 percent from 72,156 in 2010 to 72,398 in 2015. Filipinos in 2015 had more schooling than the city’s general population. 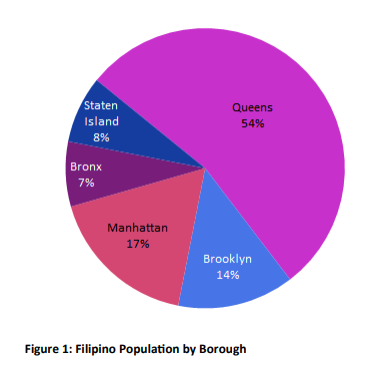 Of the city’s 63,266 Filipino adults, only 5 percent had not graduated from high school, significantly lower than 20 percent of all adults citywide.2 Also, 3 percent of Filipino adults in New York City had less than a ninth-grade education – a third of the 10 percent rate for all adult New Yorkers. 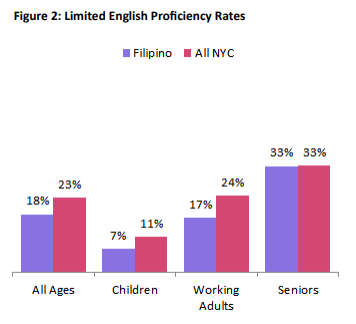 At the high end of the educational spectrum, 87 percent of Filipino adults in New York City had some sort of postsecondary education, greater than half (56 percent) of all city adults. 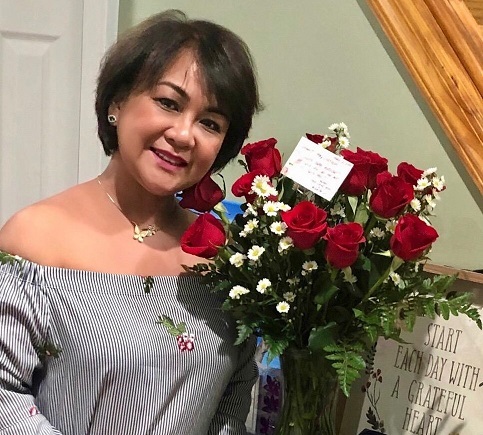 About two thirds (65 percent) of Filipino adults in New York City had a bachelor’s degree or higher, almost double the rate of 36 percent for all city adults. 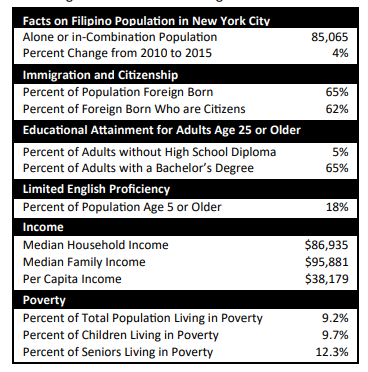 The poverty rates for Filipino residents in relation to the total New York City population were lower overall. Among all Filipinos in the city, 9.2 percent lived below the poverty line, compared with the general New York City poverty rate of 20.6 percent. One in ten (9.7 percent) of Filipino children in New York City experienced poverty, compared with 29.5 percent of all city children. Also, 8.5 percent of working-age Filipino adults and 12.3 percent of elderly Filipinos in the city lived in poverty, lower than 18.1 percent and 18.8 percent, respectively, for residents city-wide in those age groups. 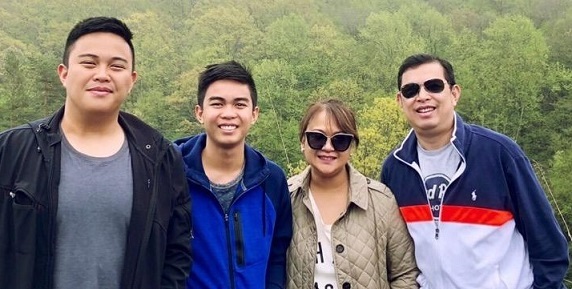 Filipino New Yorkers were less likely to be without health insurance coverage, with only 9.6 percent uninsured, compared with 12.4 percent for the general population. Among children, only 2.7 percent of Filipinos were uninsured, compared to 3.6 percent of all children. Filipinos relied much more on private insurance options than the general population, with 74.4 percent of Filipinos having private insurance coverage compared to only 55.0 percent of all New Yorkers. 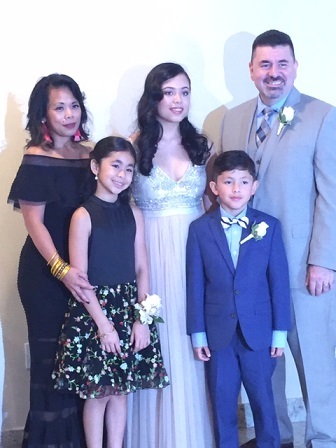 Filipino New Yorkers in 2015 had a larger average household size than households in general (2.98 people versus 2.65 people). Filipino households were slightly more likely to be overcrowded than households in general, with 11 percent of Filipino households and 9 percent of households in general having more than one occupant per room. Filipino households had higher rates of owning homes compared to New York City households in general. Almost two-fifths (38 percent) of households owned their homes, compared with 32 percent homeowners in the city overall. This is one of a series of Asian American population profiles prepared by the Asian American Federation Census Information Center (CIC) to increase understanding of the rapidly growing and diverse Asian American population in the New York metropolitan area. For more information regarding this profile, please contact the Asian American Federation Census Information Center at (212) 344-5878 x219 or howard.shih@aafederation.org, or visit www.aafny.org/cic/.